Greetings AEA365 community. My name is Paul St. Roseman, and I am the owner/principal investigator with DataUse Consulting Group. The intersection of evaluation and professional development has been an interest of mine throughout my 20-year career as an educator and evaluation researcher. Within my practice, I have observed how participation in evaluations impact how people: (a) view themselves professionally, (b) approach their work, (c) communicate with one another, and (d) discuss the operation of their organization and its impact within the community. Recently, I have begun to consider what these influences suggest about an evaluation’s overall impact on both learning and leadership development within organizations with whom I work. 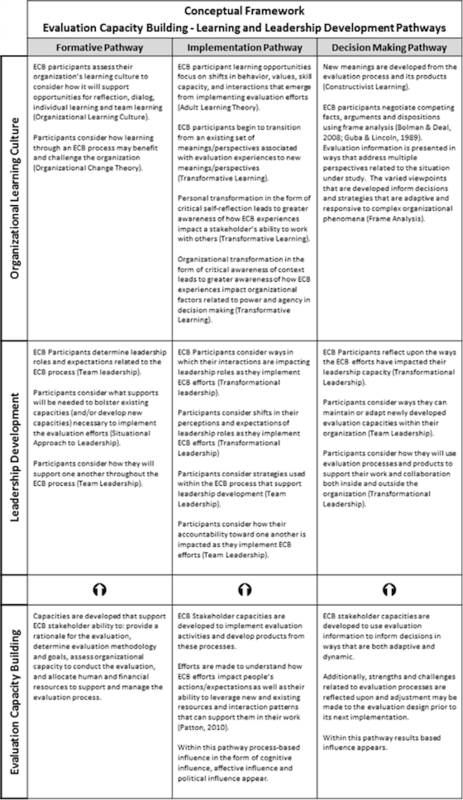 To this aim, I have developed an Evaluation Capacity Building Learning and Leadership Conceptual Framework that I use to monitor how learning and leadership development within an organization transition as a collaborative evaluation study is completed. Connecting evaluation within learning and leadership development allows me to examine the impact of an evaluation study beyond documenting organizational processes and accounting for services. With the addition of these lenses, it is possible to locate the professional and organizational development that accompanies collaborative evaluation efforts in ways that are personal, contextual, transparent and immediate. While the indicators used in this framework are far from perfect, they do provide a glimpse into what is possible when multiple theoretical lenses are used to push understanding regarding the experiences and lessons that accompany an evaluation experience. Lesson Learned: Evaluation’s influence on client development is strengthened when efforts are professionally relevant and provide increased opportunities for participation across an organization. Lesson Learned: The benefits of evaluation efforts deepen when clients are motivated, emotionally connected, and trusting of the experience. Lesson Learned: In instances where reflective dialogue occurs between clients the potential for mutual learning increases and leadership capacities shift. Lesson Learned: When clients develop the capacity to leverage existing and new skills within an evaluation study, confidence and self-determination applying evaluation findings to decision making strengthen. Lesson Learned: Newly developed evaluation processes and skills can be difficult to sustain and integrate within an organization. This is the case even when such efforts are valued by stakeholders. Given this factor, the benefits of evaluation capacity building may be most apparent in multi-year evaluations that incorporate capacity building workshops, coaching, and technical support alongside data collection and analysis efforts.